Kamlan showed off its highly anticipated crop sensor mirrorless lenses at The Photography Show, the Kamlan 50mm f/1.1 “Bokeh Beast” Mark II and the Kamlan 7.5mm f/3.5 Fisheye. “Look at this bad boy!” says Kamlan Director Xuxi Liang, handing us the new 50mm lens. The “second generation Beast”, as he calls it, is beautifully crafted and very well built, feeling solid and robust in the hand with a focus ring that is wonderfully damped. We took some test shots using a Sony A7R and the Beast, like the original model, definitely lives up to its name. It renders out-of-focus areas beautifully, with smooth bokeh and blur that creates remarkable subject separation from the background. “We will be launching on Kickstarter in May,” says Liang, at a price that will be under $200. “You can’t get such a large aperture with this price,” he reminds us, and the pricetag only makes this remarkably fast manual focus lens even more desirable. 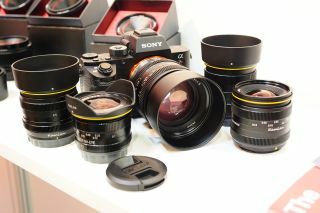 It will be available for Sony E, Fuji X, Canon EOS M and Micro Four Thirds mounts. We also got to fire off a few shots with the other soon-to-be-released lens, the Kamlan 7.5mm f/3.5 Fisheye – though this lens is only being released for a single lens mount. The 7.5mm lens delivers a 15mm equivalent focal length on Micro Four Thirds, with a fast aperture that puts it behind only the Olympus 8mm f/1.8 Fisheye Pro – which is a $1,000 lens. The Kamlan? “This lens is roughly $170,” says Liang, who adds that the 7.5mm might launch as soon as next month. With lenses such as the Olympus 150-400 f/4.5 Pro also present at The Photography Show, it’s a great time for Micro Four Thirds users to see that an already rich ecosystem is still seeing so many new and exciting lenses.